Crystal Palace have signed Brighton striker Glenn Murray. Murray, 27, who has signed a three-year deal, hit 22 goals this season to help the Seagulls to win League One. "He fits the profile for the type of player that I want to add to the squad here," Eagles boss Dougie Freedman told the club website. "He's shown what he's capable of with a fine scoring record last season in helping Brighton achieve promotion to this level." 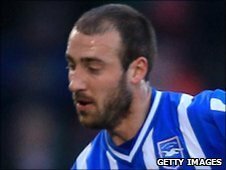 Murray joined Brighton from Rochdale in 2008 for £300,000.